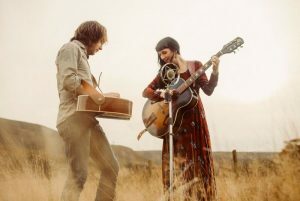 Huddled round a single microphone, singing intimate duets with just mountain dulcimer, dobro and guitar Hannah Sanders & Ben Savage are a folk duo that look & sound classically timeless, yet feel refreshingly unique. Fleetingly, they may evoke a memory of Gram & Emmylou, Shirley & Davey, or Gillian & David but their warm distilling of influences from both sides of the big pond produces a refined sound that is decidedly their own. Both hailing from folk singing families in the flatlands of East Anglia, Hannah spent much of her formative years touring Europe with her family band in a converted school bus, singing folk songs acapella in the street in order to make enough money to move to the next city. However,a sea change and relocation to the US saw her soak up the influences from the American North East and take up the dulcimer. Meanwhile Ben was writing and touring with celebrated UK folk band The Willows whose albums Beneath Our Humble Soil and Amidst Fiery Skies were championed by the likes of the BBC’s Bob Harris and Mike Harding. Born in England, raised in and around the rugged coasts of southern Ireland, Emily Mae Winters’ haunting folk songs are quickly permeating the folk and song writing scene. Influenced by the likes of Nancy Kerr, The Unthanks, The Staves Kate Rusby and Sarah Jarosz, Emily teamed up with Ben Walker to produce her first commercial release. Walker plays steel guitar and mandolin on the EP. Of the four songs on the EP, two are already award winning with ‘Miles To Go’ in the UK Song writing contest Folk Category and ‘Anchor’ winning the folk category in the Guardian Song writing Competition.